Halloween is the only time of the year when one gets to see heroes and villains on friendlier terms and even party together. 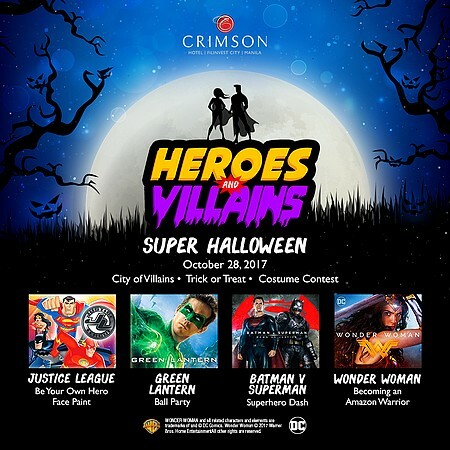 You can even dress up as one at Crimson Hotel's Heroes and Villains Super Halloween celebration on October 28. Come in your favorite Halloween costume and enjoy the City of Villains, Trick or Treat and Costume Contest activities, visit the Justice League "Be Your Own Hero Face Paint" booth, and more super activities! Tickets are priced at P950 per person for the 10 a.m. to 1 p.m. slot and P1,100 per person for the 2 p.m. to 5 p.m. slot. To make the most out of Halloween in the South, avail of Crimson Hotel's thrilling Epic Halloween Room Packages. The Dream Team package starts at P7,000, inclusive of an overnight stay, two Heroes and Villains Halloween Party passes, Halloween goodie bags, and buffet breakfast for two. You may also opt to check out The Big League package, which starts at P8,500, inclusive of an overnight stay, two Heroes and Villains Halloween Party passes, Halloween Dinner Buffet for two, Halloween goodie bags, and buffet breakfast for two. Crimson Hotel is at Entrata Urban Complex, Filinvest City, 2609 Civic Drive, Alabang, Muntinlupa City. For inquiries or reservations, call 863-2222.